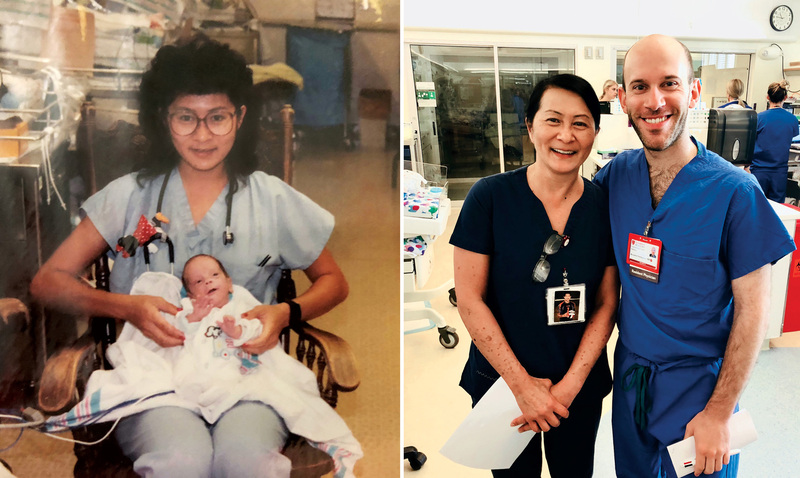 The first time Vilma Wong met Brandon Seminatore, she was a neonatal intensive care nurse at Lucile Packard Children’s Hospital Stanford, and he was a 29-week preemie. The second time Wong met Seminatore, she was a neonatal intensive care nurse—and he was a second-year resident in child neurology. Seminatore’s parents had told him to keep an eye out for Wong, who had been his primary care nurse 28 years prior, during his monthlong stay in the NICU. Once he told them he’d found her, his dad sent over a photo of baby Brandon on Vilma’s lap. “I was in shock initially, but overjoyed to know that I took care of him almost 30 years ago and now he’s a pediatric resident to the same population he was part of when he was born,” Wong told Stanford Medicine.